I love the fact that they coupled these skates/chukka boots with the fat skateboard-shoe laces, something that you would never see paired with a dress shoe and just seems throw off this entire look even more! This idea certainly shows just how intricate art can become depending on how elaborate the artists mind can be. I only wish I knew who made these. I know that Anthony Delos has done something similar but I am not convinced that those are his shoes. 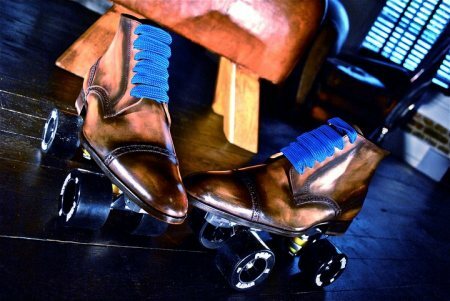 Nevertheless, I would not mind having those as my roller-skates, that’s for sure! Wow, thanks so much for your kind words! Made my day! So encouraging….!!! Why not follow my blog to keep up to date with all my latest designs? I would love to see your sketches….are they anywhere on your blog?- keep up the good work and take care…. I will be smiling for the rest of the weekend because of this! Prad – Followed! Don’t have my sketches anywhere on my blog, don’t know if I am secure enough to post them, plus I don’t want my ideas being stolen considering I want to start my own shoe line within the next 2-3 years and what I come out with will be unique. Benjy – Glad that I could make your day! these “shoes” are from the french designer Marc Guyot and have been created and shoeshined by the french shoeshine artist called HOM. Congratulations for your blog. May i put you on my blog roll ? Hugo – Thank you for writing and providing that info. You may definitely put me on your blog roll as I shall add you too! i just wrote a small post on your blog on Parisian Gentleman, and knowing the loyalty of my readers, i think you should receive a LOT of visits from them very quickly… You keep me informed ok ? Thanks Hugo, I appreciate that! I am going to introduce you on mine as well very shortly! The majority of my readers probably don’t speak French but I am sure that they will have a look and can definitely appreciate the content that you have, as I appreciate it! I will let you know when I get my boost in viewers from France! Thanks again.